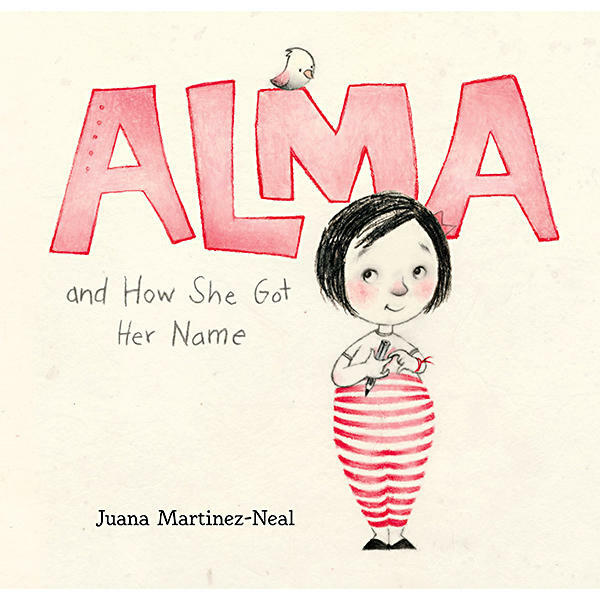 ALMA and How She Got Her Name written and illustrated by Juana Martinez-Neal is a charming picture book about a little girl with a very long name and how she finds out about family members she is named after and why. The opening illustration shows Alma as she tries to print her name Alma Sofia Esperanza José Pura Candela on a sheet of paper. But it won’t fit! Her father wisely decides to get the family album down and tell her the story of her long name by showing her pictures of those for whom she was named in honor. Alma is pleased with each gift that each family member’s name and story bestowed upon her. Her grandmother loved flowers and poetry, her great grandmother was a loving homemaker, her grandfather was an artist, her great aunt believed in the watchful guidance of ancestors and another grandmother stood up for others. Alma has all of these passions, abilities and interests. soft beauty of the story. Some of the many pleasant details such as books, animals, toys, arts and crafts have Spanish labels increasing the visual interest and educational versatility of this book. Alma and How She Got Her Name written and illustrated by Juana Martinez-Neal is a visual and cultural treat for children ages 4-8 (Candlewick Press, 2018). Children are often named after a family member. Some children are even named in honor of a famous person. Ask your parents how they came to give you the name that they did. If you could have selected your name yourself what would it have been? Why? Study the double page illustration that shows Alma painting and find the following animals: gato, chancho, caballo, elefante, perro, Llama, conejo, raton, tortuga and zorro. Can you identify these animals? Say the name of these animals in Spanish as well as in English. Always ask for help if you need it. Go through the book and find the little feathered friend that joins Alma in every picture she is in. Draw your own picture of the little bird. Be sure to give the little bird a GREAT name. Use your imagination. Print the name at the bottom of the drawing. Have fun!